When I was a kid (don’t ask how long ago that was) we had computers in the computer lab. That was the highlight of our day when we got to go there. The game that everyone was always talking about and playing was a little game called The Oregon Trail. The game was ruthless and it wasn’t a matter of whether you were going to die or not, it was when. 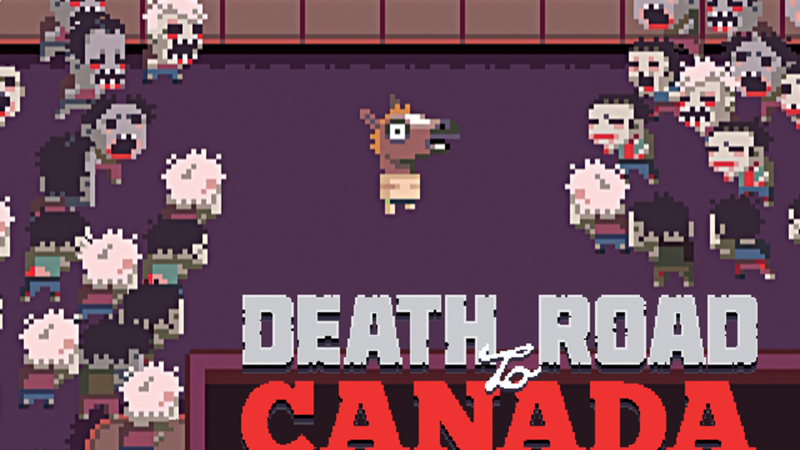 I can’t help but be reminded of this game when I play Death Road to Canada. While Death Road to Canada isn’t the first game to take on this formula, it’s very similar in certain ways. It’s also the first time it has amused me so much. You’re tasked with jumping in a car and making your way to Canada and its supposed safety. Along the way you’ll have to stop and gather supplies. At the very least you’ll need gas to keep going and food to feed your party members. There are even trading posts at certain points in the game. And you’ll have all kinds of problems along the way. Prepare to Die! A Lot! All comparisons aside, this game is a rogue like at its heart. Plan to die often and at times very quickly. It doesn’t take long to get a handle on the game mechanics but there seems to be a lot of your survival that depends on luck. The caveat of all this is that it can be very entertaining when you die. At one point I was driving down the road and my character ended up getting a bad tooth. After perusing a few options I decided to let him attempt to pull his own tooth out. That turned out to be a bad idea. My character apparently isn’t very adept at dentistry and, already being injured from beforehand, died from this attempt. I couldn’t help but chuckle. The game is full of this dark humor. It doesn’t get out of hand or too serious though. Besides the obvious ways of dying (being mauled by zombies or attacked by bandits) your character can die in the most ridiculous ways. Or they can do as one of my characters did and get kicked out. Well, okay then. See ya. I guess. Even though this game is considered a rogue-like game, there is a progressive element to it (what you would call rogue-lite). You have the option to use a randomized character or create one (or more) of your own. Part of that process is deciding on their traits and perks. Perks have to do with your character’s abilities. You pick a perk out of a varied list. Perks can make your character stronger, faster, or good with guns. Traits are somewhat similar in that they give your character different traits. These effect on how other characters interact with each other. You can make things pretty interesting if you pick something like making your character irritating to other members for example. Eventually you can upgrade perks. You earn what are called Zombo Points. In the main menu you can access an area that lets you talk to people who specialize in different sets of perks. You can use your collected Zombo Points on whatever perk you decide and that perk is then permanently upgraded for any character that has it. Essentially, your characters can get pretty strong if you play long enough. When you aren’t dying you will be making your way to Canada. You’ll have to stop for various supplies at different kinds of locations. Food and gas will be your biggest need. Weapons can be found throughout the game as well and come in a wide variety. As you stop at these different areas to scrounge for supplies you’ll have to deal with the undead. The hoard can be small to large and docile to extremely agitated. Yet another factor towards your success or not. You will mostly be using melee weapons but you can’t just go hitting every zombie you come across. Your character has a limited amount of stamina that, when maxed out, makes them very slow. So you’ll find that it’s better to avoid combat when you can. It takes a bit of strategy to make your way through streets and buildings without fighting too much. Guns can help a bit but ammo is pretty limited. At certain points in your travels you will end up getting stuck in an area with a group of zombies bent on having you for dinner. It’s called a Seige Alert and it’s up to you and your friends (if you still have any) to survive for a certain amount of time. After the time is up you have to escape. These can be very challenging depending the location. I died on quite of few of these events even when I was well prepared simply because it took place in a house and trying to escape when a hundred zombies are jammed in the door proved a little difficult. On the plus side you earn a Zombo Point if you survive. Gameplay aside, the driving portion of the game is probably the most entertaining bit of the game. It seems like anything could happen at any time. Good or bad. The car breaks down, bandits attack, or your group morale starts dropping because there isn’t enough food. Or creepy guy in a mascot outfit, that looks oddly like Garfield, is making everyone uncomfortable. An on and on. You can also pick up a variety of characters on your travels which can be good or bad depending on their traits and perks. Some more useful than others. Animals can join your group as well, which can also have different effects on the group. It’s up to you make decisions based on all these different events. Your decisions can actually mean life or death. Between random events, character perks, and other factors, there are so many ways things can go. And while I came across a couple of the same events sometimes (the bad tooth comes to mind) the end result can be wildly different. The style and the look of the game is best described as retro. The characters and zombies are all pixellated but very well done. And they come in a huge variety as well. The zombies in particular come in all kinds of states of decay and grossness. Bashing a zombie is especially satisfying as they explode into a pile of organs and gore. It’s a fun gross that was quite entertaining. All in all the art style complimented the humor of the game. In the sound department music is top-notch. It’s chippy and catchy and very upbeat. Sounds are also well done and, as mentioned before, bashing zombies is very satisfying partially in thanks to the sound of your weapon making contact. Car sounds, gun shots, and even the text sound is all well done and adds to the humor and enjoyment of the game. If you’re looking for a game that has zombies, Oregon Trail style events, and a healthy dose of humor, Death Road to Canada is definitely worth a try. It tickled my funny bone on more than a few occasions. The gameplay is good even if you find yourself dying cheaply at times. All in all I really enjoyed this one. On top of everything a friend can join you for some couch co-op zombie survival. If you enjoy rogue-like games then this is a great addition to the family. If you’re burnt out on this style of gameplay you might want to steer clear. But I would still highly recommend it.